Each, year, millions of people throughout the world are diagnosed with a form of cancer and, sadly a large portion of those will lose their battle. This is a frightening statistic and one which so many of us worldwide have been trying to change through the support of charities such as Cancer Research UK. However, unfortunately, we all know that change isn’t instant and that all important donations are still very much needed in order to fund research into cures and prevention and also to provide help and support to those who are suffering with the disease. With the help of these charities, there are now more ways than ever for you to get involved and to begin raising money for different causes which all goes towards treatment, prevention and diagnosing different forms of cancer which the final goal of beating cancer for good. One such example of this is UWCB (Ultra White Collar Boxing) who are hosting an event on December 2nd with the aim of raising money to donate to Cancer Research UK. The event is designed to help promote fitness through an 8-week course of boxing training which is open to everyone – even if you have no prior experience in the ring. These events are always sell-out occasions and, thanks to the fantastic work by the participants involved, they’re able to raise a significant amount of money which all goes towards the global fight to eradicate cancer once and for all. The events typically include raffles and auctions where all of the proceeds will go to charity but the biggest fund raiser is through the participants themselves as they raise money through sponsorship from friends, families and colleagues. One example of this is Holly Norridge who unfortunately lost her uncle to prostate cancer in 2016 and, in the same year, also lost a close friend to bowel cancer. As a result of this, she took the opportunity to push herself to the limit and put herself through the 8-week boxing course which culminates at the black tie event where she will take part in her first ever boxing match to help raise money which goes directly to Cancer Research UK. You can donate to help through Holly’s JustGiving page. Originating from New York in 1988, white collar boxing started when a doctor and an attorney both trained for a small number of weeks before having their final boxing bout at a black tie event. Ever since, the sport of white collar boxing has grown and grown to become the fastest growing contact sport in the world. Ultra White Collar Boxing is the most established organisation in this field within the UK, regularly running hundreds of different events since 2009, all with the aim of raising money for charity. Since it began, UWCB has raise more money for charity, won more awards and are the most conscientious about health and safety than any other event in the UK. In fact, they are Cancer Research UK’s biggest fundraisers in the UK, raising over £2 million alone in 2015. Take a look at donation sites such as JustGiving where there are many people, such as Holly, using this popular donation site to help gain attention and raise money for their cause. There are other sites which have a similar idea behind them such as GoFundMe who can help you manage and track your donations. One of our customers, Matt’s Mammoth Mountain Challenge use this platform to help raise money for both Diabetes UK and Mind in the memory of their son, who was tragically killed in a motorbike incident while staying in Cambodia to work with underprivileged children. The beauty of using these sites is that the money is donated directly through the site and then given directly to the charity, so you can be sure that all donations are finding their way to the right people. Of course, donating money directly to the charity is always an option, which you can typically do through the campaigns website. Finally, you could look at taking part in your own events, Whether it’s joining an event such as Ultra White Collar Boxing, or hosting your own event and raising donations through sponsorship. 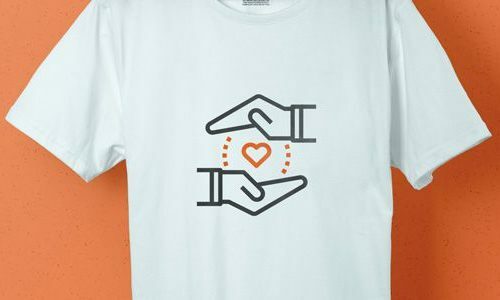 One ways in which companies help donate money is by selling custom printed merchandise with the specific aim of raising money which then gets donated to charity. We’ve all seen different companies use an approach such as “10p from every pack goes to charity”. This approach proves that the selling of different items is a great way of not only raising donations but also by raising awareness of different campaigns. T-Shirts have long been used on charity campaigns because they are easily visible, sellable and people remember a printed T-Shirt when they see it so it also helps with recognition in the future. There are various other products which can be used to raise money for donations and that’s where Garment Printing can come in and help you. We can work alongside your charity and campaign to make sure that you’re giving the right products out to help you achieve your targets. Whether you’re raising money through printed clothing, accessories, electrical products or anything else that you can think off, we can help you to raise attention and donations. Because we’re passionate about making the world a better place, we also offer an exclusive 20% discount to charities to help them on their way to achieving their targets through the help of printed products. So, if you are running an event and you need to raise awareness, or if you’re looking for a unique way of getting donations, contact our expert team who are able to discuss our wide range of products and how to customise them to get the most impact.